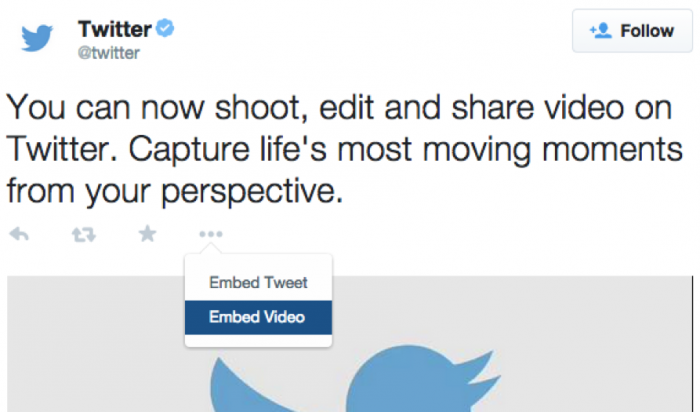 Web professionals can now add Twitter-hosted videos on their websites, thanks to a new embedded video widget from the social network. The widget enables users to embed videos captured and uploaded through Twitter’s Android and iOS apps as well as Twitter Amplify partners. To embed a video, users must click on the “…” in a Tweet and then select “Embed Video.” From there, users must copy and paste the generated HTML markup onto their website to display a video-focused embed. The video widget then displays the full Tweet when a viewer selects the Twitter logo.